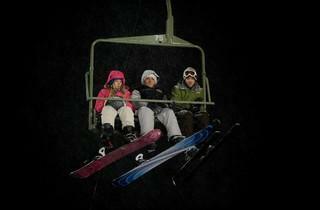 There’s a moral here: never bribe a ski-lift operator to let you have one last run before sundown. It’s the end of their weekend break and three students are heading for a final session when their ski chair comes to a halt, leaving the trio dangling 40 feet above hard-packed snow. At first their banter is cheerful, and they’re confident that someone will spot them. But once night draws in, the lights go out, the temperature falls and a series of eerie howls are heard echoing through the valley, their jokey demeanour morphs into chilled fear. Unless someone takes the plunge, all three will remain in a state of suspended animation. Adam Green’s taut, toe-curling survival thriller is better than it should be: the concept and the characters’ behaviour are mostly plausible, the script is dark and funny, the acting is adequate, and the wildlife scenes are convincing. Sure, we can nitpick about continuity and tapered endings, but as low-key, low-budget filmmaking, ‘Frozen’ is a minor success. One more reason to stay at the lodge and get hammered. This taut thriller about a weekend getaway gone horribly wrong will make that ride up on the lift if you do ski that much more terrifying. God forbid that lift stops for any reason on the journey to the top. I'll take my chances in the chalet with the bar running out of hot toddys. Well acted, greatly timed suspense with the additional horror of hungry wolves thrown in just for added measure. This is the type of movie that Hollywood should be creating instead of Freddy, Leatherface, Michael Myers, Jason, House of Wax, Don't Be Afraid of the Dark retread,revisioned,remade shlocks of that is being churned out time and time again.